This package deal saves you at least $25 and lots of time and worry. Make it easy on yourself and get everything together with only one shipment to worry about. Show your new Sailor how proud your whole family is of their hard work. 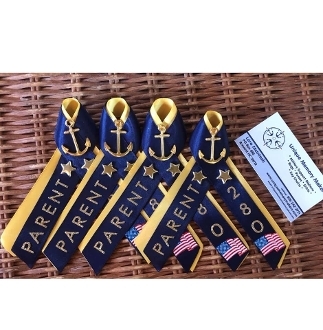 Click to add the flag to your ribbons if your Sailor has other close family members like parents, grand parents, siblings who have served or are serving in any branch of our military. Click to add the music note to the ribbons if your recruit is in the Choir or band. Both of these are part of the 900 divisions. You get 4 I survived Boot Camp Tee shirts..... My Son/Daughter/Grandson/Niece/Husband/Etc went to Boot Camp and I survived ....... Boot Camp Shirt with Ship, Ship Name, Ship Number, Division Number, Proud Mom/Dad/Nana/Wife/ etc. The ship Silhoutte is made to look like the actual ship that your Sailor's barracks are named after. You choose shirt color and size. Plus sizes are a little more depending on the size. You also get 1 Hotel PIR Door Banner..... With Your Sailors last name at the top, PIR Date, Ship Silhoutte, Ship Name, Ship Number, Division Number, etc just like shown in the picture. The Banner is made from durable fabric with all edges closed, two loops at the top for hanging. You can iron the back or the banner to remove wrinkles before hanging on your hotel door. Just fill in all the blanks when you order. The ship Silhoutte is made to look like the actual ship that your Sailor's barracks are named after. I have designed each one of them for the shirts and PIR Hotel door banners. I also do custom orders just send me a message.